James Leslie Love, one of a dozen children, was born and raised in Moulsham, Chelmsford. He worked as a fitter at Clarkson’s steam bus factory and then at Hoffmann’s bearings works. 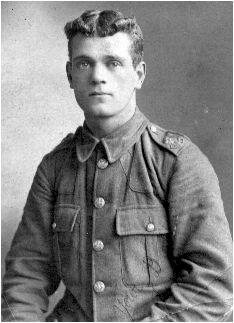 After joining the army he went to the Front late in 1916. He died from his wounds near Bethune in February 1917. 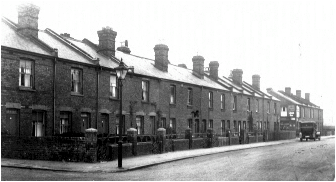 His home was in New Writtle Street. James was born in Chelmsford in 1894, the son of James Alma Love (born in 1857 at Widford) and Margaret Love (nee Taylor) born in 1862 at Baddow). His parents had married ay St. John’s Church in Moulsham on 14th March 1886 . At the time his father was a 28 year-old tiinsmith, living at 145 Moulsham Street, Chelmsford; his mother five years younger and lived in New Writtle Street. 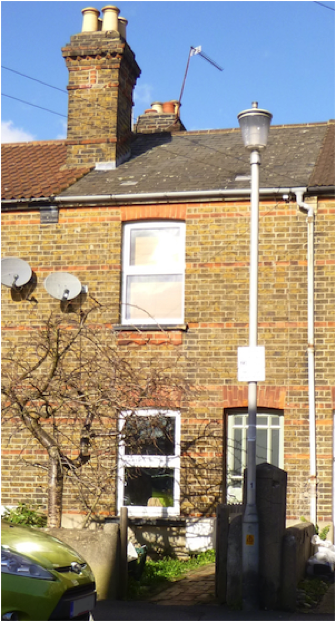 In 1891 they had been resident at 15 New Writtle Street, Chelmsford. James was one of twelve children. His elder siblings were Florence Mary Love (born 1883), Edward Alma Love (1887 – 1967), Walter Charles Love (1889 – 1964), Ada Blanch Love (1890 – 1942), Alice Annie Love (born 1892), George Joseph Love (1896 – 1984), Ernest William Love (1898 – 1973), Ivy May Love (1901 – 1952), Edith Emily Love (1903 – 1941), and Clifford Bernard Love (1904 – 1971). All were Chelmsford-born. engineers. The family were to remain at the address until after the War. The 1911 census recorded 16 year-old living there with his parents and seven siblings. James was a fitter at Clarkson’s motor works in Moulsham; his father and brother Walter were tinsmiths at Crompton’s electrical engineer’s; sister Alice was a sorter at Hoffmann’s ball-bearings factory; while brother George was an office boy at Clarkson’s. 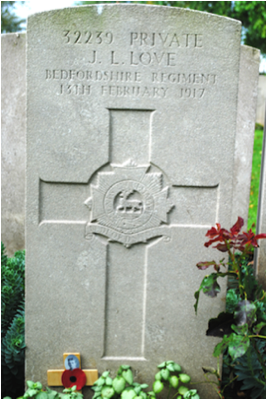 James lived and enlisted at Chelmsford, serving as Private 1653 in the 2/5th Battalion of the Essex Regiment, subsequently transferring to the 8th Battalion of the Bedfordshire Regiment, where he was Private 32239. It is unknown when James went overseas, but by February 1917 he was serving in France. On the 10th of that month his battalion relieved the 2nd Battalion of the Yorkshire & Lancashire Regiment in the Hohenzollern Left Subsector. B, C & D Companies were in the front line, with A Company in support. The following day, 11th February 1917, enemy snipers were active killing three other ranks and wounding one officer and four other ranks. On 12th February 1917 the Germans fired trench mortars on James’ battalion, though there was some respite from the enemy snipers. 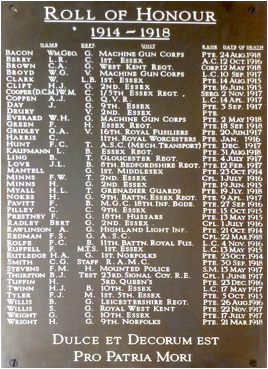 On the next day, 13th February 1917 James died of wounds, aged 22. His death could have been a result of injuries that day when two soldiers in his battalion were wounded, or from wounds received during the preceding few days. Today James lies at Bethune Town Cemetery, Pas de Calais, France, 29 kilometres north of Arras (grave: VI. B. 49). 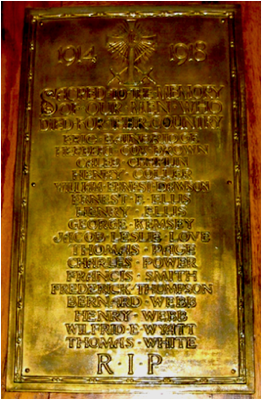 James is commemorated on the Civic Centre Memorial, Chelmsford, on the Hoffmann Manufacturing Company’s War Memorial at Chelmsford Cathedral (pictured below), the Moulsham Parish Memorial, St John’s Church, Moulsham, and on the War Memorial at Church of Our Lady Immaculate in New London Road, Chelmsford (pictured left). He was entitled to the Victory and British War medals. 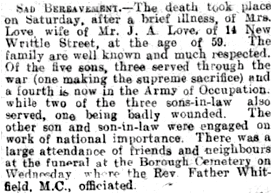 “Love, - In loving memory of our dear son, killed in active service on Feb. 13th 1917. A year has passed. our hearts still sore. As time goes on we miss him more. No soldier so true and kind. A more beautiful memory left behind. He bravely answered his country’s call. His sweet life he gave for one and all. From Mr. and Mrs. Love and family, 14 New Writtle Street, Chelmsford. In early 1918 James’ brother Ernest suffered gas poisoning while serving abroad and was brought back to England to recover. James’ mother died in 1921, aged 59. His father died in 1927, aged 69.